This 4-1/4" stroke 8-1/2" diameter flywheel assembly replaces the original flywheels in S&S® 80" V80 engines and in 1984-'99 HD® Evolution big twins. Balanced to stock 80" cast pistons. 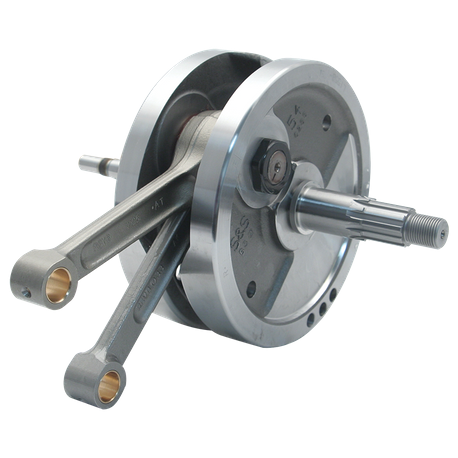 Flywheels are CNC machined from heat-treated, closed die, steel forgings, and are stronger than cast iron or late style steel flywheels. Dynamically balanced and fully assembled with premium quaility S&S® mainshafts and heavy duty 7.440" connecting rods.